Say goodbye to "midseason" and hello to more original, year-round content at CBS. The network's new 2014-2015 primetime schedule will feature eight new series -- with five to launch in the fall. CBS is also picking up NFL Thursday Night Football and ending the long-running sitcom "Two and a Half Men," which runs for just one more season. During Wednesday's upfront media call, CBS Chairman and CEO Leslie Moonves spoke about the current stage of TV. "This really is the best era in the history of television. There are more great shows all over the place," he said, citing broadcast and cable networks. "Online there are some great things going on over there....Content is really what it's all about." For CBS, the focus will move away from midseason and instead cater to programming centered around the four seasons. "We're going to have 90 hours of original programming this summer...The September to May doesn't work like it used to when you have that kind of quality of original programming," said Moonves, who cited the success of last year's summer hit, "Under the Dome." Nine dramas will return this fall, including "NCIS: Los Angeles," "Person of Interest," "Criminal Minds," "Elementary," "The Mentalist," "CSI: Crime Scene Investigation," "Hawaii Five-O," "The Good Wife" and "Blue Bloods." The five returning comedies are "Mike and Molly," "The Big Bang Theory," "The Millers," "2 Broke Girls" and "Two and a Half Men," which will begin its 12th and final season. Reality series "Undercover Boss," "The Amazing Race" and "Survivor" will also be back on the small screen. One series that is not getting picked up is the "How I Met Your Mother" spinoff, "How I Met Your Dad." "There were elements on the pilot that didn't work out," Nina Tassler, CBS entertainment chairman, said. "We tried to work out about redoing the pilot. That's not happening right now. Sometimes you run into these kind of issues and you hope they can resolve themselves in that time frame." "Madam Secretary," a new drama starring Tea Leoni as the newly appointed U.S. Secretary of State. "NCIS: New Orleans," a spinoff of starring Golden Globe Award winner Scott Bakula. "Scorpion," a high-octane, thrill-ride drama starring Elyes Gabel, Robert Patrick and Katharine McPhee. The show inspired by the true story of an eccentric genius and his team of brilliant misfits working to protect the U.S. from high-tech threats. "Stalker," a new psychological thriller, starring Maggie Q and Golden Globe Award winner Dylan McDermott as detectives who investigate stalking incidents. "The McCarthys," a new ensemble comedy, starring three-time Emmy Award winner Laurie Metcalf, Jack McGee, Tyler Ritter and Joey McIntyre as members of a sports-crazed Boston family. 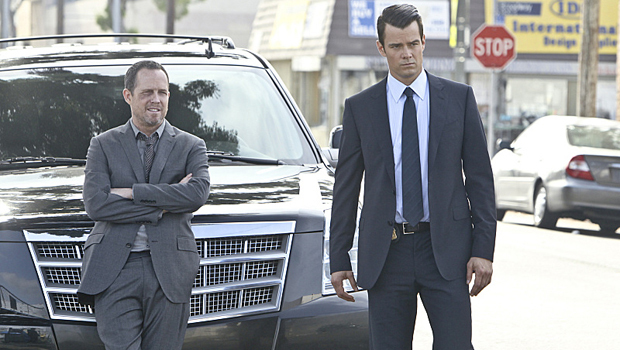 Other new series include "Battle Creek," a new drama from "Breaking Bad" creator Vince Gilligan, which stars Josh Duhamel and Dean Winters, along with a modern take on the classic comedy "The Odd Couple," starring Matthew Perry as Oscar Madison and Thomas Lennon as uptight neat freak Felix Unger. "CSI" is also branching out with "CSI: Cyber," a spinoff from the creative team behind the signature series, with Emmy Award winner Patricia Arquette as an investigator who delves into the world of digital crime. Some shows are shifting nights and times. Check out the lineup below, and for more on the new series, click through the gallery above. 8:00-8:30 PM "The Big Bang Theory"/"2 Broke Girls"
10:00-11:00 PM "NCIS: Los Angeles"
9:00-10:00 PM "NCIS: New Orleans"
10:00-11:00 PM "Person of Interest"
8:00-9:00 PM "The Amazing Race"
9:00-10:00 PM "The Good Wife"
10:00-11:00 PM "CSI: Crime Scene Investigation"/"CSI: Cyber"